After Trump’s election, millions of words were typed about how ‘blue collar’ areas had turned out to vote Republican. Yet Clinton led by 11% among voters who earn less than $50,000. Trump secured his victory by winning among those who earn $50-200,000. Much the same can be said for the far right in Italy, whose core support is in the wealthier – though now de-industrialising – north, rather than in the more impoverished south; or about Brazil, where 97% of the richest areas voted for the fascist Bolsonaro, whilst 98% of the poorest neighbourhoods voted for the Workers’ Party candidate, Haddad. The way we talk about social media is central to narratives that blame the oppressed for their own oppression. Online bigotry, abuse and trolling are often framed as problems of the unwashed masses, who need to be regulated by ‘benign’ institutions such as global data corporations or the police. In reality, whilst racism, Islamophobia, misogyny, anti-immigrant hysteria and other forms of bigotry feature up and down the social spectrum, their recent mobilization is part of a different story. It has been led and co-ordinated by elite networks, seeking to reshape the world at the dusk of neoliberalism. And they are often in direct collaboration with these supposedly respectable institutions, from Facebook to the FBI. To put it another way: the decade since the financial crisis has accelerated the emergence of a new global oligarch class. With growing wealth has come growing power and a growing ability to shape political debate through the dominant communications technology of the era: TV and the internet. As has long happened with right-wing movements, they have done so in close collaboration with military and security networks. Because the era is neoliberalism, those networks are largely privatised, made up of mercenary firms with names like Palantir, Arcanum, SCL, AggregateIQ and Cambridge Analytica. And we know that Kentish, the pro-Brexit chief executive of the STM group, which specialises in offshore wealth preservation, has been arrested in Gibraltar under its proceeds of crime act, and has had brushes with the authorities in Malta, Jersey, and St Kitts and Nevis. 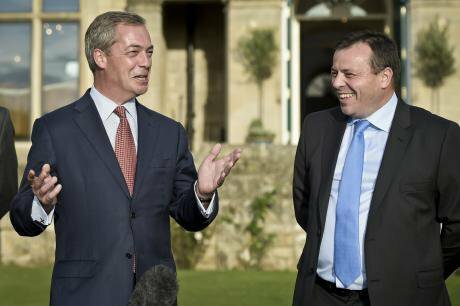 We know that the person who introduced the UKIP frontman, Nigel Farage, to the supposed money man, Arron Banks, is the Isle of Man-based Brexit-backing billionaire Jim Mellon, who made millions from mass privatisations after the collapse of the Soviet Union in the 1990s. And we know that Arron Banks lied about meetings with the Russian embassy, to which it now turns out he was a regular visitor, discussing various business opportunities. How Banks’s millions were spent is, largely, a mystery. Under the referendum rules, Leave.EU could spend only £700,000 in the last ten weeks of the campaign, but spending before that period isn’t restricted and doesn’t have to be declared. When I compared the declared donations to Banks’s various groups and the amounts they said they spent in that limited period, there was a gap of £11m. 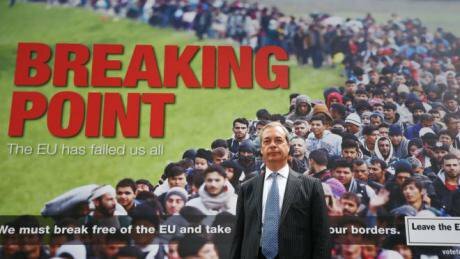 Nigel Farage with "Breaking Point" poster. Image, BBC, fair use. Cook’s group, the Constitutional Research Council, also provided a route for cash to be funnelled into the key organisation of Brexit-backing Tory MPs, the European Research Group. MPs from across the political spectrum have written to the Electoral Commission, demanding a ‘full investigation’ of the controversial DUP cash. The regulator has yet to respond. However, Vote Leave was eventually fined by the regulators over a different affair, where it got round referendum spending limits by giving £675,000 to a small campaign run by a fashion student in his early twenties called Darren Grimes. At the same time as funnelling this cash to Grimes’s campaign, Vote Leave gave £100,000 to another group, Veterans for Britain, which in many ways represents the core of the part of the establishment which brought Brexit to Britain. Veterans for Britain is more than the hobby of a few ex-squaddies. Its advisory board includes a collection of very senior retired military figures. Most senior of them all is Field-Marshal Lord Guthrie, the former head of British armed forces and chief of defence staff. Like many former soldiers in the contemporary era, Guthrie took up a new career later in life. 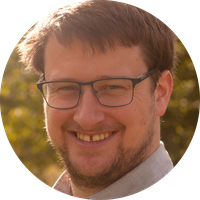 In 2017, he was appointed advisor to the chairman of Arcanum, which describes itself as ‘a strategic intelligence company that provides services to sovereign governments and multinational corporations’. Arcanum’s staff have also included Bernard Squarcini, former chief of France’s Central Directorate of Interior Intelligence, the (late) former Mossad chief Meir Daggan, the former US director of national intelligence, and the former director of the UK’s National Crime Agency, who in that role was chairman of the ‘Five Eyes’ Anglophone intelligence alliance, whose surveillance activities were famously exposed by Edward Snowden. Arcanum’s chairman himself – Ron Wahid – has described Brexit as ‘an opportunity for American business’. Go to the SCL website and it’s very clear what it is: the first line of the home page reads, ‘SCL provides data, analytics and strategy to governments and military organisations worldwide.’ In 2006, the author Hywel Williams described them as ‘the first private company to provide “psyops” to the military’. We also know, after Facebook finally gave in to significant pressure, what sorts of messages the Leave campaigns were targeting at people online. Two years after the referendum, a UK parliamentary inquiry got its hands on the adverts Vote Leave had promoted online. Images supplied by Facebook to the DCMS Select Committee inquiry into Fake News, available here. It transpired that while the supposedly respectable official Leave campaign had focussed on the economy in the traditional media, its targeted Facebook adverts, seen by millions of people across the country, focussed very heavily on immigration and on Islam. Online communications technology is sometimes described as though it’s some kind of voodoo – able to hypnotise audiences into doing anything. This is a mistake. But it’s also a mistake to discount it entirely: companies pay for advertising because it works. Neoliberalism in general, and the asset-stripping of the former Soviet Union in particular, produced a new generation of oligarchs, expert in hiding money from the prying eyes of state officials. Traditional authoritarianism emerges from alliances between the very wealthy and military and police networks. But neoliberalism has also delivered a largely privatised military, and it is to them that this rising class has turned when it wishes to secure power. This article first appeared in Eurozine.